If you or a loved one suffered complications from an IVC filter, contact the Steinberg Law Firm. IVC filters have been linked to a high rate of fractures and migration, which could cause severe internal injury or life-threatening complications for individuals. 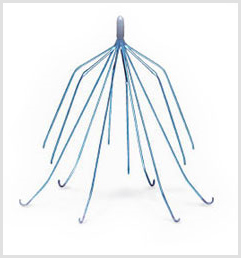 IVC filters, which is short for Inferior Vena Cava filters, are cone-shaped and have legs that extend to intercept and trap blood clots. IVC filters, also known as greenfield filters, are usually implanted in patients who are at risk of developing a pulmonary embolism or blood clot in the lungs. In April 2003, Bard introduced the Recovery IVC filter. As a result of several reports of broken filters, Bard redesigned the device and released the Bard G2 IVC filter in October 2005. This model was meant to be more resistant to fractures than its predecessor, but has now been the subject of numerous reports of IVC filter fracture and migration. If you or a loved one suffered complications from an IVC filter, contact the Steinberg Law Firm P.C. at 888-529-4688 or email andrewsteinberg@lawyer.com. We encourage you to contact us at 888-529-4688 to discuss your IVC filter case with an experienced personal injury and wrongful death attorney. The Steinberg law firm does not intend, by this web site or otherwise, to dissuade anyone from taking medication without their doctors' approval. Please consult your doctor, not your lawyer, on matters relating to your health. It could be dangerous to stop taking medicines, especially abruptly. Patients should talk to their physicians to decide whether the benefits and risks of IVC filters make it the right choice for them.